Shiitake mushrooms are unique because there is almost no snobbery between the use of dried and fresh shiitake mushrooms. Each serves its own purpose and has a long (think centuries) history in Asian cuisine. Dried shiitakes are often rehydrated in soups or steamed and have a powerfully concentrated umami flavor. Fresh shiitakes are popular stir-fried, fried, and sauteed. The tender caps are typically thinly sliced and have an almost melting texture that tastes rich and savory. Mushrooms, especially shiitakes, are often consideed the meats of the vegetable world and are a favorite in vegetarian's and omnivore's diets. 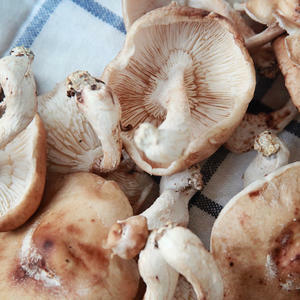 Shiitake mushroom stems are edible, but are seldom included in dishes because they are woody and not very flavorful. Shiitake mushrooms also have a strong medicinal history and are an incredible source of B-vitamins. Shiitake mushrooms also provide zinc, manganese, phosphorus, iron, and Vitamin D.